Just a few new things we’ve gotten!! 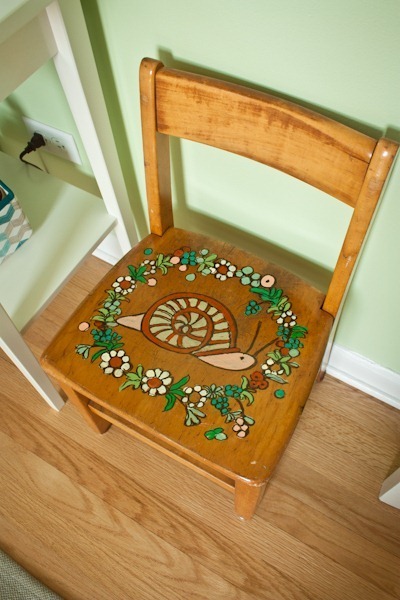 Also from my talented grandmother – this cute painted chair! She had 4 of them – a butterfly, grasshopper, frog and snail – that she did for her church and passed them on to us this past weekend. Matt’s Father’s Day gift!!! I asked him what he wanted and he said “something primate” for the baby. I was having a hard time finding a monkey that was “us.” When I saw this at the Seattle Fremont Market I HAD to buy it!! 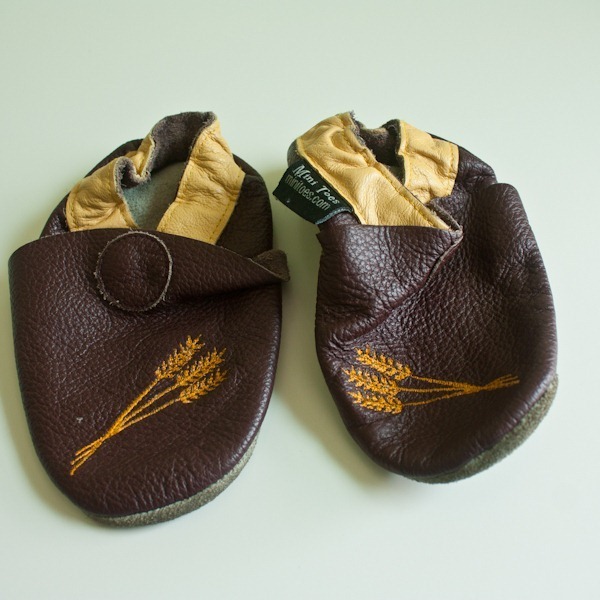 Lastly, my friend Lara gave me these little shoes that she used on her boys a few times. They are just like the Great Harvest logo!! Might be a year or more before our baby can wear them, but I will keep them tucked away! Those shoes! Those books! Those chairs! That shirt! ….all perfect! Isn’t it fun getting ready to bring someone into YOUR family and start YOUR traditions and show them YOUR loves! 🙂 Aw! I still can’t believe how big their little teeny tiny feet get so fast! I have a lot of books for my toddler (and three week old haha), but some of those make me REALLY feel that I need more! 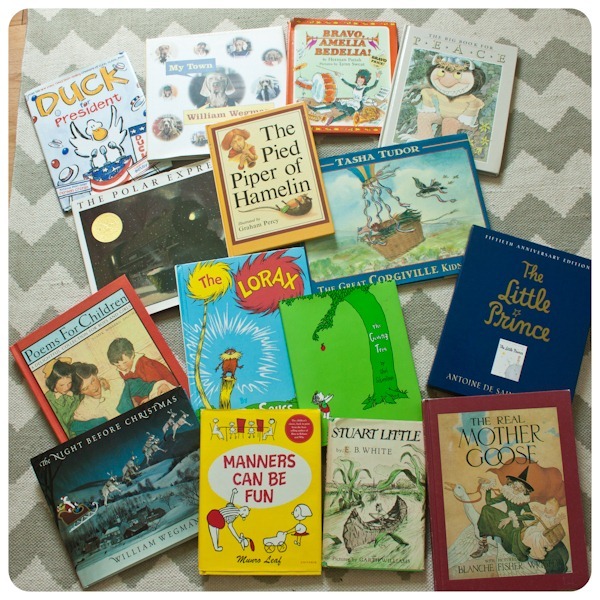 The Giving Tree and anything Amelia Bedelia need to be in my collection! Beautiful chair. Your gma is really talented! What a great book collection! I am a huge fan of Amelia Bedelia! The Giving Tree was my favorite when I was a kid. Loved it. Never too soon to start buying board games either. 😉 My nephew loves them. Start reading those books aloud now! When I was in grad school I learned about vocabulary development w/age you start reading to your child. I was shocked at how much larger the vocabulary was when started in utero vs. starting at 6 months or a year. I can’t remember the numbers, but it was profound enough that I made note of it and am now reading to my little one in utero. 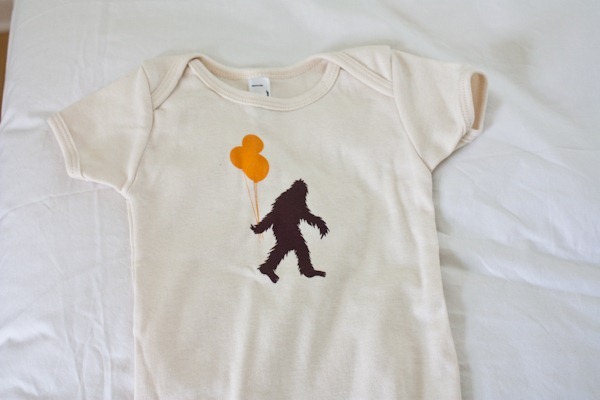 Oh, and that onesie is freaking adorable. 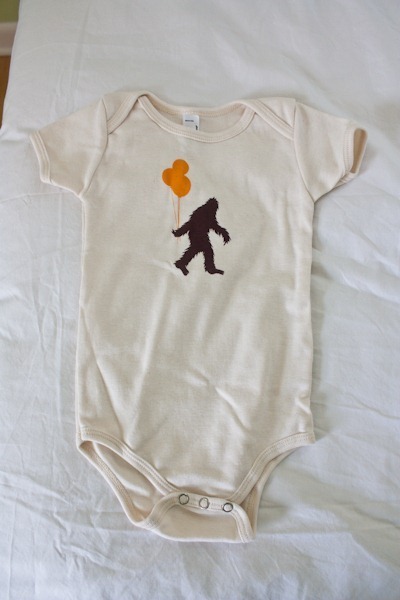 I’d call it a Sasquatch – since the Sasquatch Music Festival is at the Gorge, a few hours away from Seattle. Your grandmother is so talented! I love those shoes. I never realized why you called Matt Kanz, funny. “The Giving Tree” is my mostest favoritest [sic] ever!!! Kath, I just love your grandmother’s artwork!!! She is very talented!!! I wish she had a Web site where I could purchase some of her Van Gogh’s 🙂 Please tell her that I am her biggest fan! 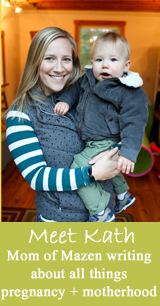 Love all the personal things for your little guy! And I see you have the giving tree, my favorite childrens book! I remember loving Amelia bedilia but don’t remember anything about the story! Love grandmas artwork too – priceless! I think that your grandmother has awesome taste. 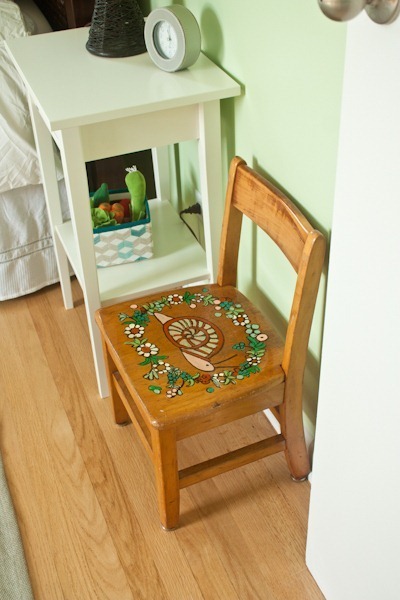 What wonderful additions to your baby’s room. I can’t wait until my little one arrives so that I can start reading to him or her. Love to see all these books! Reading to my babies has always been one of my favorite daily activities! Now Baker,who lived in the pumpkin shell? 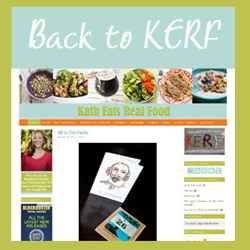 Who could eat no fat? What did Wee Willie Winkie do? How many blackbirds were baked in the pie? I know this isn’t a recent post, but I saw the books and I had to share. When my daughter was pregnant with my grandbaby, she had 3 showers planned. We knew there was no way for us to keep all the cards she would receive, so in the invitation we asked that everyone bring their favorite childhood book and write a special message in it for Carlie (my grandbaby) to enjoy as she grows. After 3 showers the only book that we got more than 1 of was the Pokey Puppy-we got 3 of those lol. Carlie is 2 1/2 (tear) now and she has 2 bookshelves full of books. We still to this day read the special note when we read her a book she received as a shower gift. It is something she can treasure forever. Those shoes are too cute!!! And that is a fabulous book collection! My parents read “The Polar Express” to us every year on Christmas Eve when we were growing up! OMG those booties are too cute! Could there be anything more perfect for you? !